Do you know someone who has just done something great? Perhaps it's a graduation or following a dream. 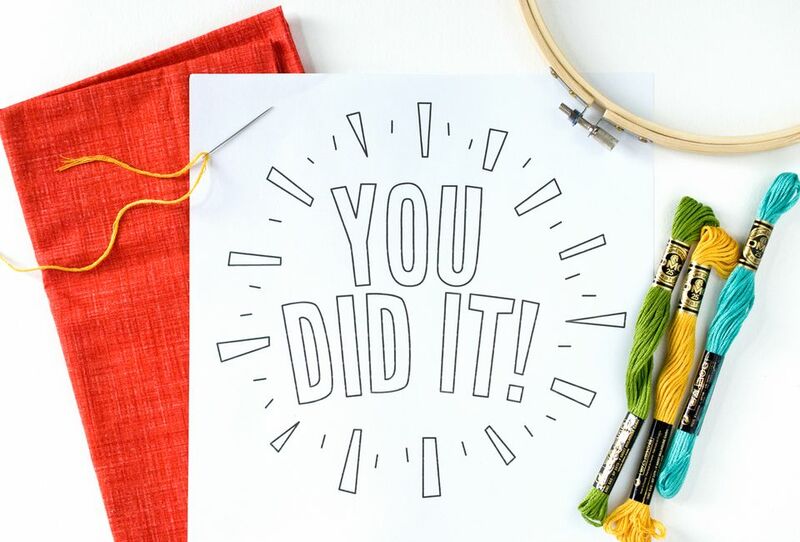 No matter the occasion, why not embroider your congratulations with this "You Did It!" free pattern? We designed this pattern with graduation season in mind, but it's important to recognize achievements big and small. Stitch it for a coworker who got a promotion, a child who learned to ride a bike, or a friend who made a big decision. And when your or the person you stitch this for sees it on a regular basis, they'll be encouraged to continue to do hard things. To strive. To achieve! You could even embroider this for yourself. Celebrate that you did something! With that in mind, this would be a great first embroidery project. You can stitch it all with basic stitches, and you'll have something to proudly display when you're finished! Because this makes a great reminder, it's perfect for making into a wall hanging or framed hoop. When you scale it down a bit, you can also make it into an ornament to keep around all year. The design is suitable for hoops ranging from 4-10 inches. You can use image-editing or word-processing software to do this. Print the pattern and use your favorite transfer method to mark the pattern on your fabric. We like printing directly on water-soluble stabilizer, as it saves a lot of time on tracing. Plus it shows up on pretty much any material you would be embroidering. The bold design of the pattern makes it a good candidate for using bold colors, both for the fabric and the stitching. But the design also leaves your colors choices wide open, so you can use the hues that the recipient loves. For a quick stitch, embroider the entire design in back stitch. Use all six strands for the words and three strands for the decorations. If you have more time, consider filling in the words with satin stitch or seed stitch. You might even want to embroider a few of these to have on hand for those times when you need a special congratulatory gift. Just about anyone would love some stitched encouragement from you!